Large-screen HDTVs are selling in huge volumes over last few years, primarily driven by amazing improvements in picture quality & form factor (thinner screens). The form factor constraints from having skinny screens result in tiny built-in speakers that are undersized, under-powered and are typically aimed at wrong direction. Hence sound bars have exploded in popularity as complementary audio system by providing a sound experience that more closely matches the TV’s life-like pictures. In addition, with release of HDMI 2.1 specification we finally have a nocompromise audio solution for HDMI as part of the eARC [enhanced Audio Return Channel]. 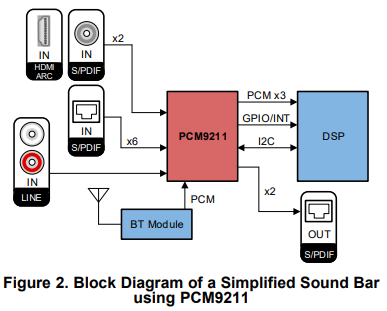 This tech note reviews eARC and simplified Sound Bar design using PCM9211 and how to interface eARC signals with PCM9211.